All commenters on this post through 11:59 P.M. CDT, May 18, 2013, are eligible to win either a print or e-book copy of Heart’s Safe Passage, book #2 in The Midwives series. Answer the question at the end of this post or share a story of a boating/sailing experience. For the adventurous soul, few machines created by man are more a call to adventure than a ship. Thousands of books have been written where the setting is a wooden sailing ship. Unfortunately, the terminology aboard a ship can begin to sound like a foreign language to the average reader. Here, I hope to give a brief primer on sailing ships. When I was twelve, my family took a vacation to Florida, where I enjoyed the privilege of exploring the ship used in the movie “Mutiny on the Bounty”. Yes, that tall ship from the age of sail that foundered and sank, taking its captain with it, during hurricane Sandy last October. That incident saddened me, for I fell in love with sailing ships upon that wooden lady. For two decades, I read every book I could find on sailing ships, the age of fighting sail and other resources. I even sailed on the HMS Rose, rechristened the Surprise for the movie “Master and Commander”. So I know more than anyone needs to on an average reading day; therefore, will make this simple. Let’s begin with the truth that a ship is a specific type of vessel. It is square rigged and has three masts. Just because something sails on the ocean does not make it a ship. We have brigs and sloops; schooners and brigantines; luggers and. . . you get the idea. These differing names are due to number of masts and type of rigging, lessons to which entire books are devoted and too complex for this post. Ships themselves are broken into various categories. In the Age of Fighting sail, these delineations were crucial. For an example that drives me a little crazy, a frigate is a naval vessel. Although the lengths vary, it is around 150 feet long and usually carried 32-42 guns. Frigates were not used by private citizens except perhaps a pirate who had stolen one. And if he did, you better believe somebody’s Navy was hot on his rudder. And what is a rudder anyway? It’s that big piece of wood that drops down into the water and helps steer the ship. Cables connect it to the wheel or tiller, in a smaller craft. And speaking of cables, sailing vessels have lines and hawsers; cables and chains; they do not have ropes. These things may be made of hemp and look like ropes to landlubbers. They, however, aren’t called ropes upon a ship, as each type of “rope” has a specific purpose. One of those purposes is the rigging. That’s really complicated, so let me talk about a few things here. A sheet is a type of line. Despite how it sounds, it is not a type of sail. It’s attached to the sails to help keep them from flying off to nowhere, which is where we get the expression “three sheets to the wind” for someone who’s inebriated. If a vessel has three sheets of a sail flapping in the wind, that sail is likely to tear away and leave the craft wallowing and going nowhere. Other rigging lines are shrouds and ratlines. Shrouds are the horizontal lines that help support the masts. Ratlines are the vertical lines, which, along with the shrouds, form a sort of ladder to the top. Come back on June 15 for Part II and more chances to win Heart’s Safe Passage and. . . Something else. What books set aboard a sailing craft have you read? If you haven’t read any, will you tell us why not? I absolutely LOVED the HMS Bounty! I was so heartbroken when it sank and it is so tragic that two people were lost to the sea as well. This was a very interesting post. Thanks for sharing and God bless. Never thought that books written about life on ships would be my "cup of tea" - but, after reading some recent book reviews of same - have changed my mind. Hope I win the copy of your book - thanks for the opportunity! I have visited numerous ships across the USA - some of them sailing ships, some still in use - & would have to say that visiting Pearl Harbor was the most inspiring, hands down, & most enjoyable were cruises to Hawaii & Alaska. The most frightening boating experience was a number of years ago when the engine of my brother's small boat flooded near Charleston at dusk - sitting on the water amongst large freighters, I prayed hard for a few minutes (until he got it started again)- I can't swim! Hello, never knew so much about ships til this post, lot of stuff to learn isn't there? I have just finished reading "No Safe Harbor" where the young lady traveled by ship and lived near the docks..interesting. Recently read one where young girl worked as translator for Navy man and was by the docks often..so Yes like reading about adventures that takes you on the waters and near them. I would love to read your story, must say that is a beautiful cover. I personally have not been on a ship or on waters except in small boat with hubby. I am a bit obsessed by tall ships, so I've read all I can get my hands on - but I DON'T have Heart's Safe Passage, so please enter me in the drawing. I've been studying ships for the last year or two and last September I spent a day sail out on Lake Erie aboard the US Brig Niagara. It was such an amazing day! Thanks Laurie Alice - a super subject and I love the amount of research you do for your stories! I am trying to think of a book that I have read that is set aboard a ship. I know I have but off the top of my head I can't think of it right now. I like books in which the characters travel on a ship to get where they are going as I find the life on a ship interesting. I just had the please to tour El Galeon last Saturday celebrating the history of ships. I had a nice time and thought it was neat to see the inside of such an old ship. Thank you for the chance to win this book, what a better book subject matter - midwives and ships. I have read Mary Lu Tyndall and many other books that have been set aboard ships. Please enter me in the drawing, thank you. Thank you all for stopping by. Even if you don't win, I hope you consider taking a serious look into buying Heart's Safe Passage, where a midwife ends up going to sea with her pregnant sister-in-law to rescue her husband from an English prison during the War of 1812. The captain is, of course, yummy. That's reason right there to read it - "The captain is, of course, yummy." Debra, I sailed on the HMS Rose, which is now the Surprise, but I toured the Pride of Baltimore II, which was an early clipper built in 1812. Beautiful vessel. Loved this post! I have always loved "ships" and books about them. I have read quite a few! My mom is a wonderful painter and has done a few ship paintings that I have hanging on my wall. Can't wait for next month's installment! I read Prize of my Heart by Lisa Norato last year, and more recently Surrender the Heart by MaryLu Tyndall. In both women end up abord a ship when they don't want to be! Every year on the Saginaw Bay not too far from us, there is the Tall Ships Festival. I've seen pictures, but never gone before. I hope that one day soon our family will be able to take a trip there to see the tall ships, and they look amazing! And they have all kinds of activities for kids that have to do with sailing. I know I have read different books that were set aboard a sailing ship, but the only one that is coming to mind at the moment is an old one - "The Hawk and the Jewel" by Lori Wick. Read that one a looooongg time ago! Enjoyed this Laurie Alice! Just enough to whet my appetite for more, but not so much that I'm overwhelmed. I've read all of MaryLu Tyndall's books, which are so rich in pirate detail. Can't wait to read Heart's Safe Passage! Thanks for the giveaway! How wonderful to have ship paintings. I grew up not that far from Saginaw Bay and spent a lot of time on boats, or so it seems from my memories. I went to a tall ships festival in Milwaukee and got lots of pictures. I need to get them scanned, esp. the one of me standing in the rigging. wife of the ship's captain who oversees the voyage after he takes ill. I even wrote a book called Mutiny of the Heart that has several scenes on a ship. Like several others - I've read and loved Mary Lu Tyndalls books. Still trying to convince my husband that pirates can become Christians too! I have no sailing experience other than a cruise OR frog gigging with my uncle and daddy, as a kid. We were in a boat, on a river - does that count? My job was to hold the burlap sack & peel the frogs off the gigger. Would love to read your book! I am in the process of reading, "Queen of the Waves" by Janice Thompson. The "sailing" craft in the book is the Titanic. Thanks for giving me the opportunity to enter the giveaway. Hi Laurie Alice.. great article!! You have a wonderful way of explaining things! I'm waving at all my dear readers and friends who have commented. Laurie actually helped me out a lot with ships when I first started to write. She's a volume of great information and so kind to share it with anyone who asks. 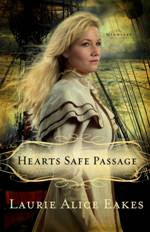 Heart's Safe Passage is a GREAT book that I highly recommend.. so if you don't win, please consider purchasing a copy... Hugs to all ye sea-faring wenches out there!! Great article Laurie Alice. I have some of MaryLu Tyndall book and really enjoyed them . I would love to win the giveaway .Thanks for giving me the opportunity. I have read quite a few Christian novels that were set aboard ship, one of the earliest was the Song Of Acadia series which had several shipboard sections. Some of my favorite shipboard stories are MaryLu Tyndall's books, as well as Linda Chaikin's. I have also read a few for school including a Rover Boys book, one of the Ruth Fielding books, Treasure Island, Four Navel Heroes, Captain's Courageous..... Not to mention a few Nancy Drew and Hardy Boys books. I think my reading has been pretty salty of the years. Even though I am a mountain girl and have only been to the sea once, saw the Pacific Ocean for a couple of hours, lighthouses, ships, and the sea have all had a pull on me since I can remember. I'm sure I've read some books set on ships, but can only recall a couple. One was a Frank Yerby novel that I read years ago about slave trading. I think The Immigrants by Howard Fast was a novel that began on a ship. One of my favorite books as a teen was Kon-tiki. Does that count? It was only a raft, so I guess not. Good book, though. I have read and of course enjoyed MaryLu's books. I have also read a number of different stories set on the Titanic. I am sure I have read others as well, just can't remember exactly which ones right now....lol. This book sounds wonderful. Would love to win it. I was on a sailboat once in College. A friend and I went out (neither of us knowing how to sail) and we could not get back in to shore. It was a little spooky. Luckily a group of men came and pulled us in to shore (thankfully they felt sorry for us). It made for some fun memories from college. I have read all of MaryLu Tyndall's pirate books along with Linda Chaikin's books. Also read a book recently about the Titanic called Promise Me this by Cathy Gohlke and liked it. Love these books! What a wonderful post! I have been wanting to read this series Laurie, but had no idea it also involved a ship! I grew up on the Jersey shore and adore anything and everything to do with the sea....from the sand, sea glass, to anchors and waves....I love boats,and even the smell of the salty water. Although I get extreme motion sickness, I adore it all. now 37. I have read Gilbert Morris' and MaryLu Tyndall and even classics. I even enjoy the paddle wheel steam boats. Recently we went to Missouri and we loved seeing the old time boats right near the Arch. Lisa Tawn Bergren's Northern Lights Trilogy. Thanks for having the giveaway. I live in Florida surrounded by water, yet I do not know how to swim and still have a fear every time I am aboard a boat. I have never been on a ship, but, I love reading about them, as they hold a fascination with me! Your book sounds like one I would keenly enjoy. Thanks for the opportunity of being able to win it! This book looks delicious! One of my books is the biography of Jacques Cartier and I researched the Mary Rose quite a bit for information. I would love to win this book. Currently I'm reading Colleen Coble's Set Sail My Heart. Fascinating! It was so sad when the Bounty sank recently - such a majestic ship. Would love this chance to win your book. I am very interested in midwifery as well. I think I have read one or two but it was so long ago I can't remember the names, that's what getting old does to a person, lol. I've been reading Gilbert Morris's House of Winslow Series that traces a fictional family from the reign of King Henry to the 1950s. The family traveled on the Mayflower as well as having some adventures to foreign lands aboard ships. He puts great details in his books and it was neat to read about the life aboard a ship. My deepest apologies for not contacting you all sooner. My computer has had some serious issues with its ability to stay online. The winner has been drawn by random number. First, I want to say that Marylu is the true queen of the waves in Christian fiction. Announcing the winner in my next comment. Johnette, I'll be contacting you via the e-mail address you left.